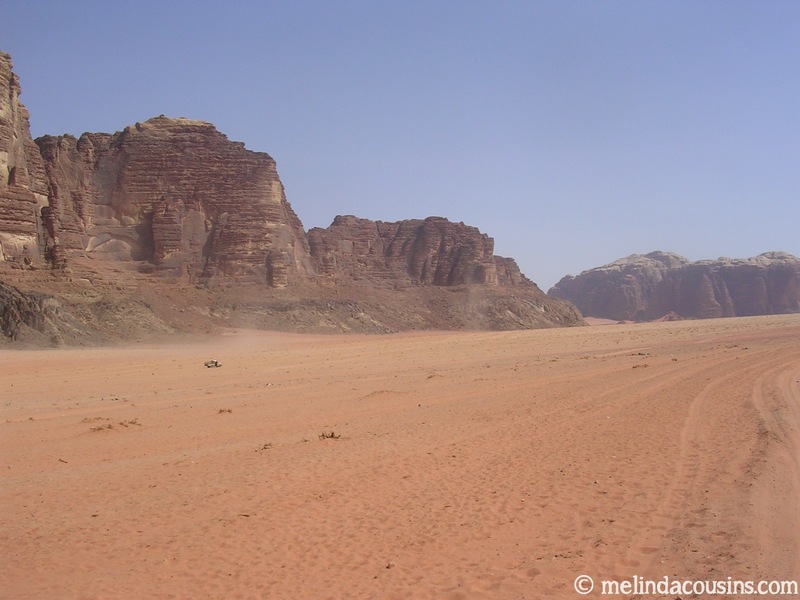 Monday morning and I’m back into routine, but today I’m thinking about a place about as far away as possible, in the middle of the Jordanian desert. 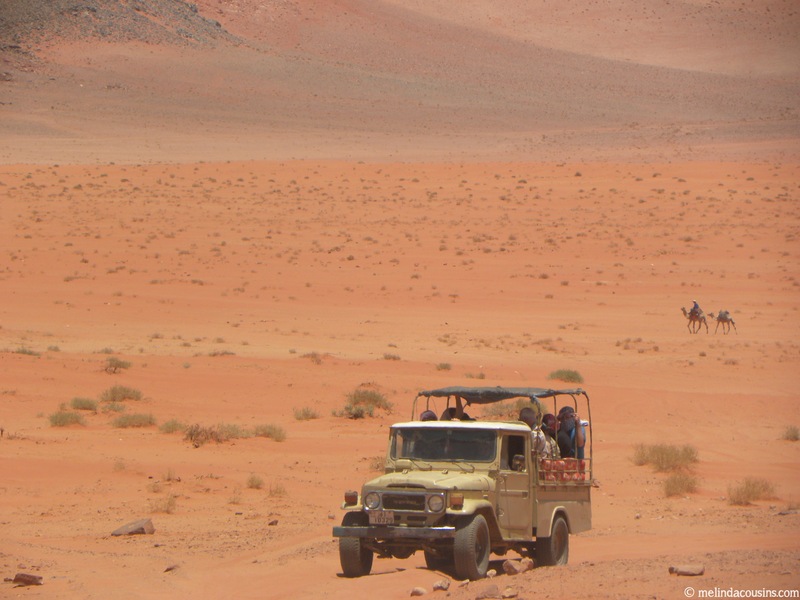 Most tourists to Jordan visit Wadi Rum for a day, zooming through the wilderness in the back of a jeep, and I’ve done so twice in the last few years. It’s a place made famous not only because the Hollywood movie Lawrence of Arabia was filmed here, but because it is the real place British army officer T E Lawrence spent time during World War I. It’s also in the vicinity of where the Israelites travelled from Sinai to the Promised Land, and perhaps one of the easier places to imagine the kind of landscape they experienced during their wilderness wanderings. 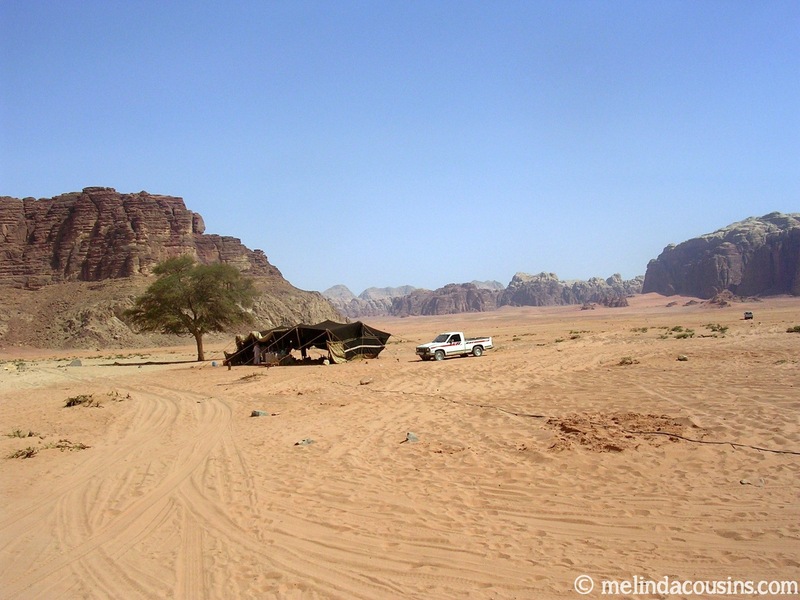 What did I love about Wadi Rum? 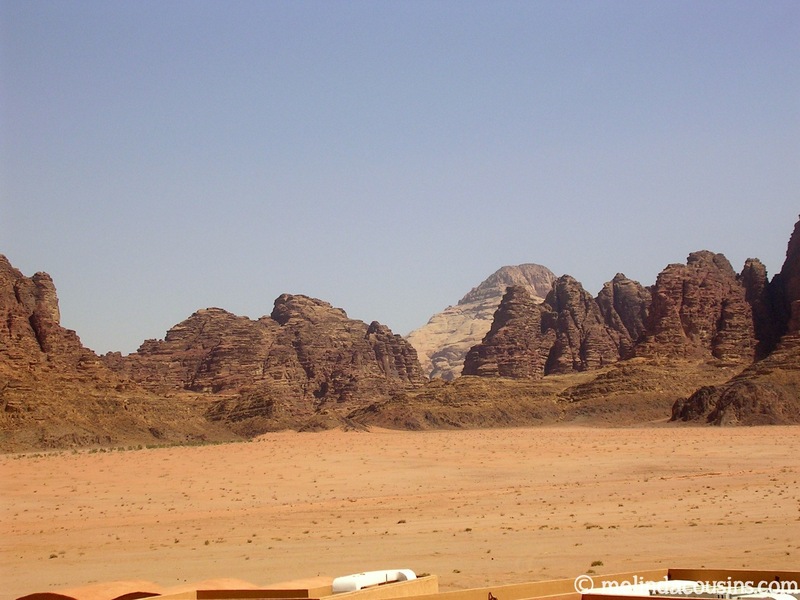 Wadi Rum is a place of wide open spaces. 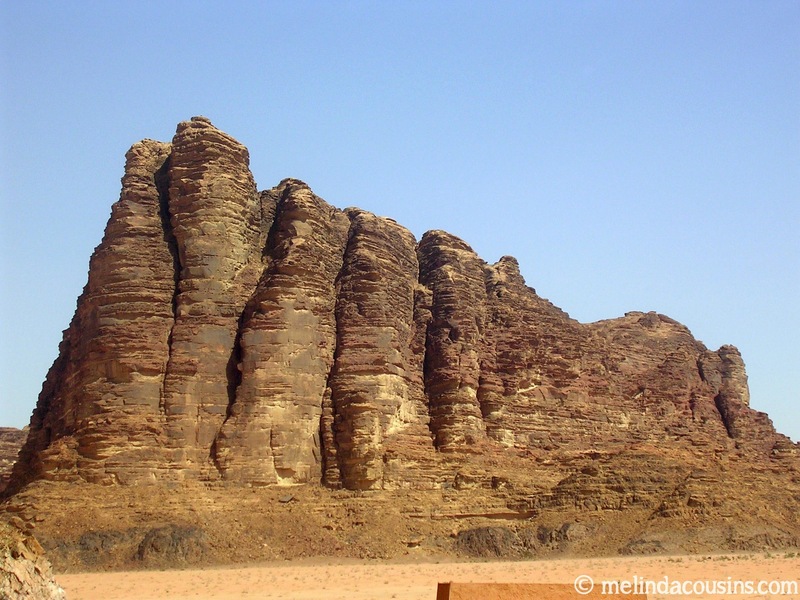 The sandy desert is surrounded by majestic rock formations, giving a sense of being cut off from the rest of the world. It has a breathtaking beauty in its starkness. 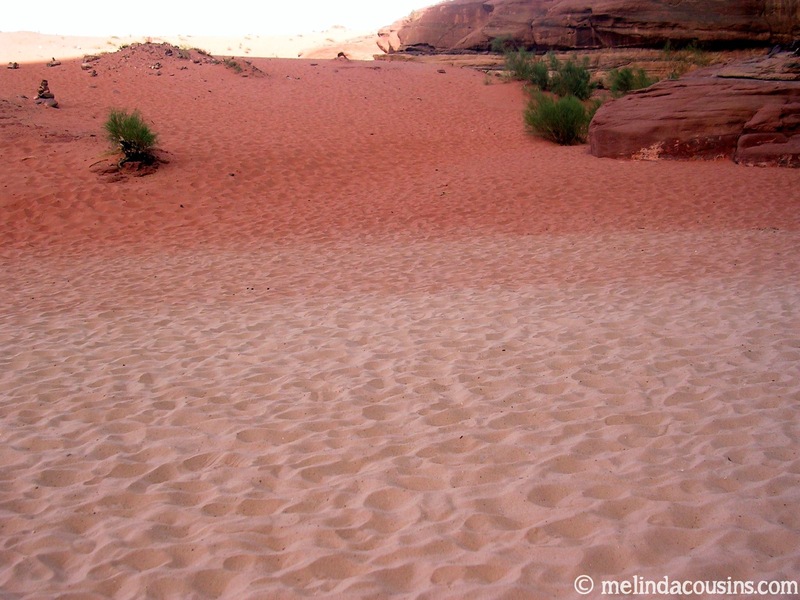 The colours of the sand and rocks are incredible in their diversity. It is easy to imagine the past in a place like this, particularly as reminders of those who came before and their way of life are all around. It is a place where the locals live simply, with many things not having changed for thousands of years. 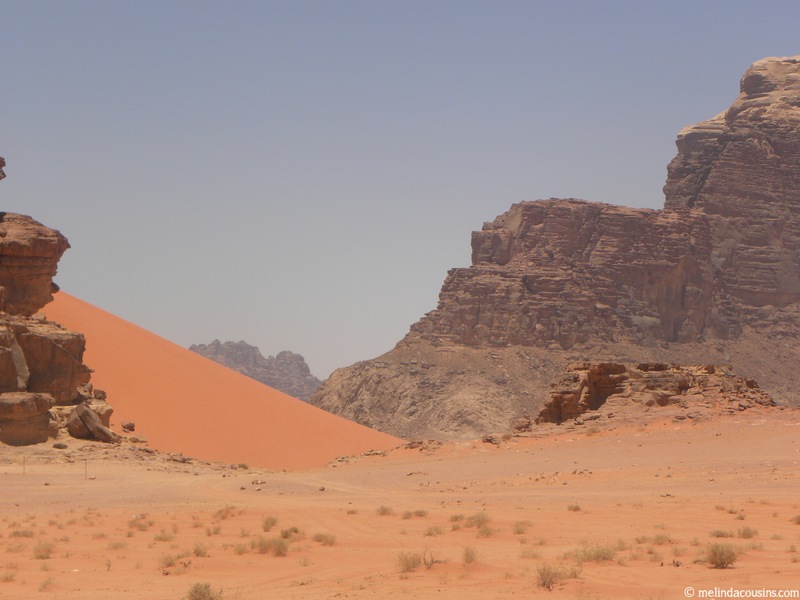 What did I learn from Wadi Rum? 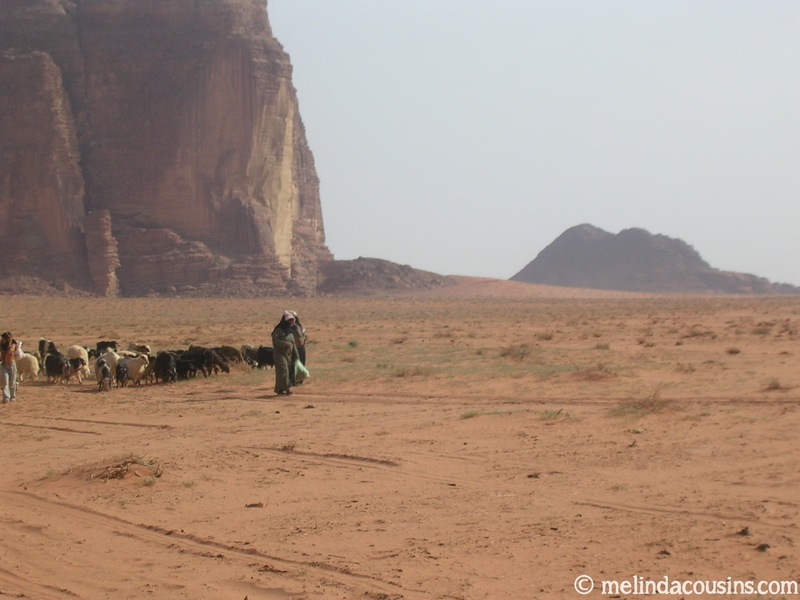 The local Bedouins welcome visitors to the area, and share something of the life they and their forebears have enjoyed in this place for centuries. 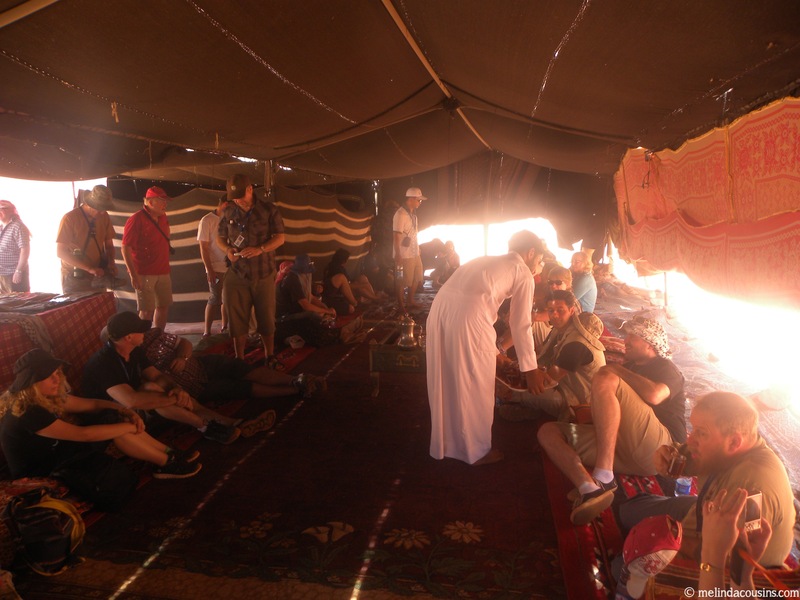 The key practice of the Bedouins that is demonstrated with simplicity and clarity is hospitality. The welcome of the stranger as a friend, the invitation to share, making what they have available with open hands. 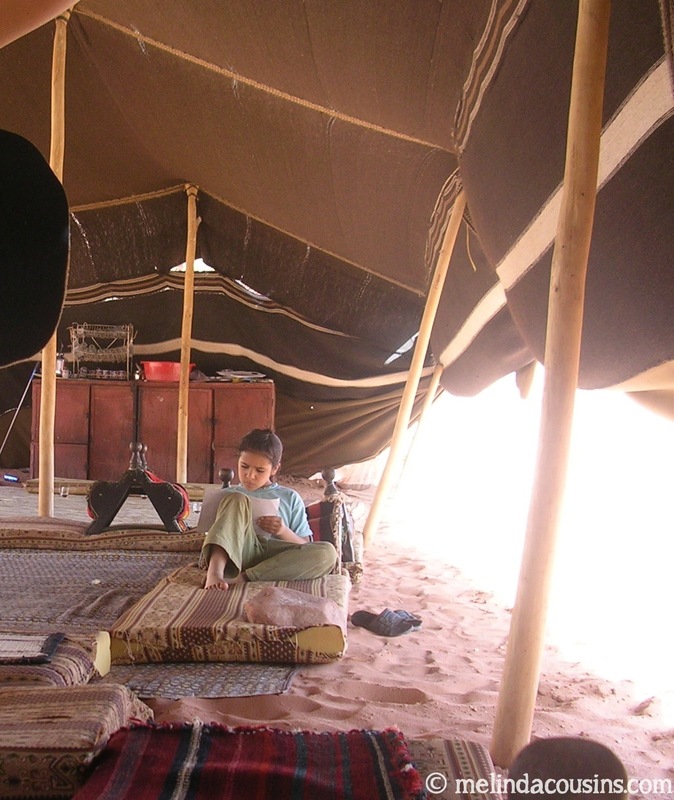 The Bedouin honour code requires even enemies to be provided with food and shelter for three days. In such a harsh place, where survival is on the line, generosity and hospitality are shown in ways not so common in places where we have so much. Too often we think hospitality is about putting a good ‘show’ rather than genuinely inviting people to share what we have as they have need. 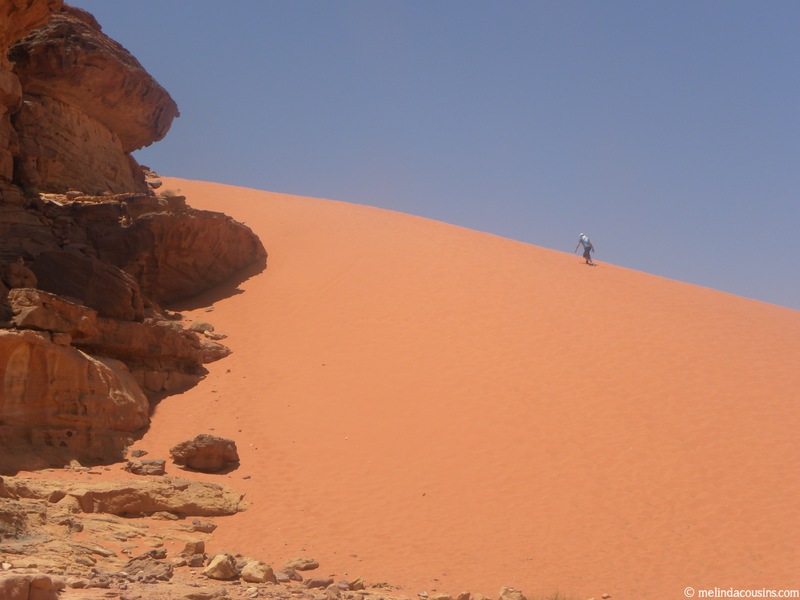 The Old Testament was written in this part of the world, and one of its pervasive underlying metaphors is of God as our host. The God who invites His people to eat at His table, to shelter in His dwelling place, to share His home, and to find protection in His blessing. We can miss the power of this picture if we miss the importance of hospitality to the original cultural context. 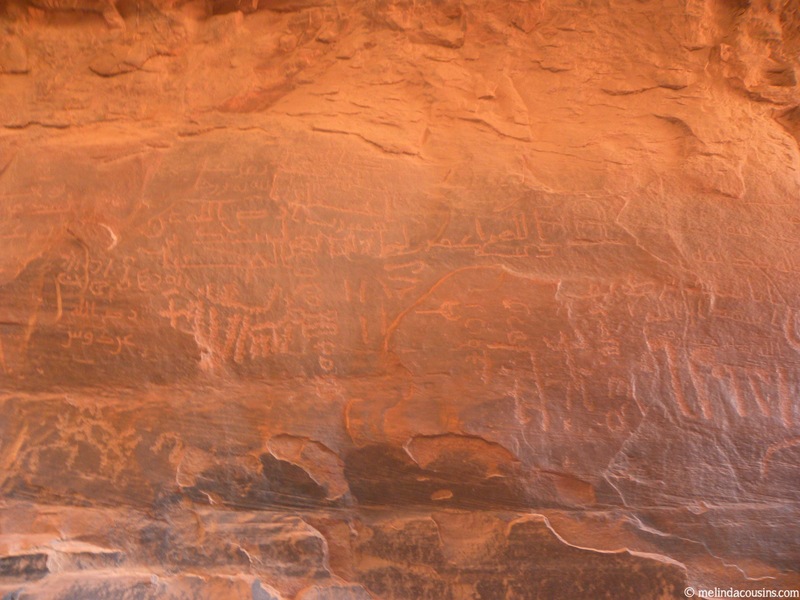 The people we met in Wadi Rum taught and reminded us of the great gift of hospitality, a gift which is not dependent on appearances, resources or wealth, but on a generous heart and a willingness to invite someone into our lives, treating them not as an alien or stranger, but a friend and neighbour. They showed me again a picture of the love God has for me as He invites me into His family, and the love He calls me to show to my neighbours, strangers and even enemies. While in Sydney last week I had the opportunity to be in the live audience for the ABC’s Q and A program. I was in Sydney for the Rethinking Conference at which Miroslav Volf was speaking about faith and public engagement. 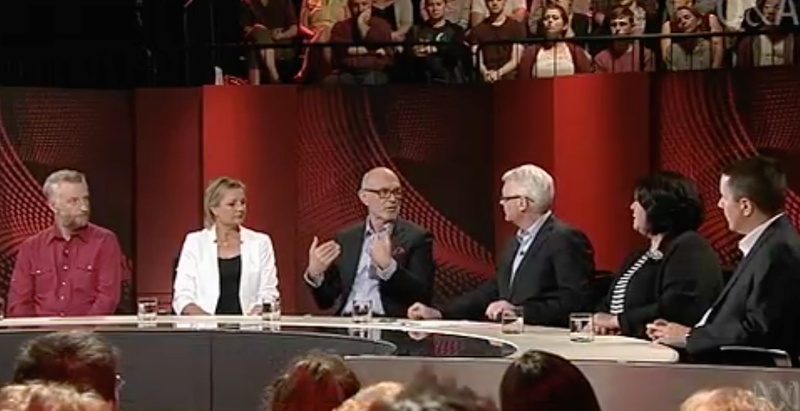 I’m still processing my thoughts from the conference overall and am hoping to post some reflections in the next week or so, but I thought Volf’s appearance on qanda embodied the kinds of things he spoke about at the conference. I also thought there were some clear echoes of the way that Jesus engaged with people publicly. So here are my observations of how Volf engaged, and the echoes I saw of Jesus. I think they present some important challenges to Christians today in the way we think and act when it comes to engaging with our wider community as people of faith. When Volf was introduced by Tony Jones as a “Christian intellectual” you could hear the audience snicker. Many people in our culture have preconceptions about what Christians will be like in their public engagement and they are not usually very positive. Although I and others I knew in the audience had submitted what we thought were thoughtful, broad-ranging questions for Volf, these were not chosen to be asked. Those questions that were chosen were generally on the narrow range of issues people expect Christians to want to talk about in public. What I loved was seeing how Volf didn’t answer those questions as people expected him to. I think the Christian woman who asked him how to handle public ridicule got a bit of a shock when he pointed out that the persecution he suffered as a Christian in his homeland was not necessarily a bad thing for him, and that Christianity operates best from the margins. I wonder if too often people don’t want to hear a Christian perspective because they think they already know exactly what we are going to say? The first topic of the night was the arts. Volf was not included in this discussion until the very end, and it seemed he was not expected to know or care much about the topic. I thought his response to this issue set the tone for the whole program, as he was able to show other members of the panel that he had an intelligent perspective on an issue that they cared deeply about, and was able to demonstrate points of connection between their vision for the world and his. Again, he refused to let himself be boxed into only speaking on a narrow range of issues. Similarly, Jesus didn’t just speak about the “spiritual” issues people expected him to care about. He spoke about paying taxes, and caring for the poor, and how to treat your neighbour, and living with fear and anxiety, and the need for imagination and purpose. He spoke about the social, economic, political and religious issues of his day. The message of good news he shared touched every area of people’s lives and makes a difference to their everyday realities. Genuine faith should touch all areas of our lives too, and we should be able to find many areas where we agree with and support the perspectives of others. This was on display from most of the panel all night. I wondered if Volf and Billy Bragg, a socialist and atheist, were put on the panel together in an attempt to create some controversy and drama. If so, it didn’t work, because they spent much of the night agreeing with each other, and when they disagreed they did so amiably. Volf didn’t argue or raise his voice, but showed that he was listening respectfully to the other voices in the conversation and seeking to understand where they were coming from. His tone was as important as his content. Likewise, Jesus engaged people with love and respect, compassion and grace. He certainly had his moments of controversy, but these were usually with the religious leaders who were trying to put him into a box on “their” side! To “outsiders” he was known for his generosity and hospitality. Too often Christians are seen to be argumentative, judgmental and hypocritical, and I think it is our responsibility to demonstrate the opposite attitude in the way we engage. Above all, I thought Volf didn’t say too much. He got more opportunity to speak than I was expecting him to, I think because of the way he engaged, but what he tried to do was raise questions and not give all the answers. At the end of the show, I felt he didn’t leave people wishing he had just shut up, but rather wishing they had heard more from him. This reminds me of Jesus and his propensity for telling parables. These certainly didn’t tie up all the loose ends, but left people to ponder, question, think, and hopefully come back for more. When people asked him questions, he often didn’t answer, but left them with questions of his own. Why do so many Christians feel like they have to say everything in one go? What are we afraid of if we don’t answer every possible question? Interestingly, most of the criticism I have heard of Volf’s qanda appearance has come from Christians who didn’t think he spoke clearly enough about the issues that they are passionate about. That he didn’t tie up the loose ends or say the things people were expecting him to say. Conversely, people who do not share his faith have generally seemed impressed with him. This too reminds me of Jesus … the religious leaders of his day were angry that he didn’t meet their expectations, or answer all their questions, or condemn all their so-called enemies. Perhaps there is something for all Christians to learn from. Our goal is not to preach to the choir, and perhaps the choir won’t be entirely happy no matter what we say. But if our goal is to invite those who do not share our faith to listen to what we have to share and consider it for themselves, then echoing Jesus in how we go about it seems like a powerful and effective idea. After spending the weekend in Sydney, then teaching a class in Adelaide this morning, this afternoon I am jumping on a plane to Melbourne to speak at a conference for the next few days. I’m trying not to compare these three cities, because I love them all, and I just want to enjoy each one for what it is! 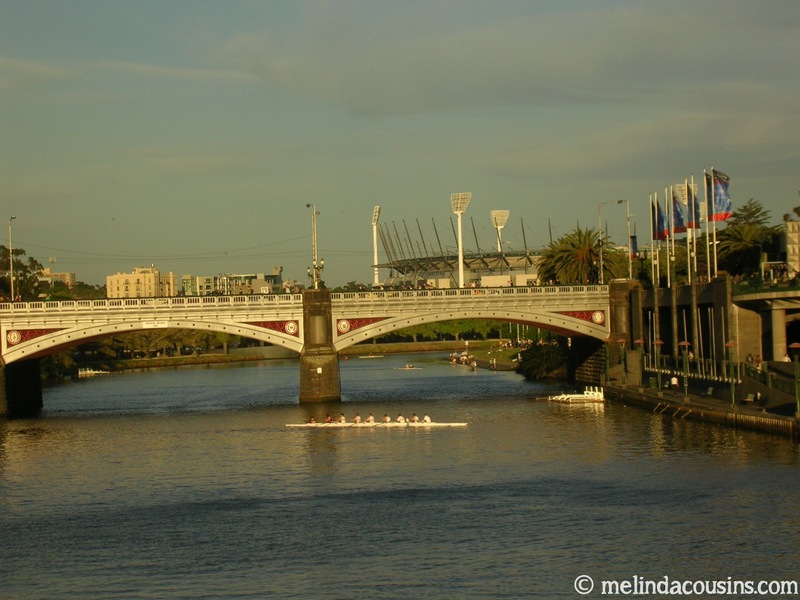 Growing up in Sydney, there was often an implicit attitude that Melbourne was second-best. Now I live in Adelaide, where some people still view Melbourne as the enemy, mostly due to our seeming inferiority complex, football enmity and the “stealing” of the Grand Prix (we need to let it go Adelaide, it’s been 20 years). 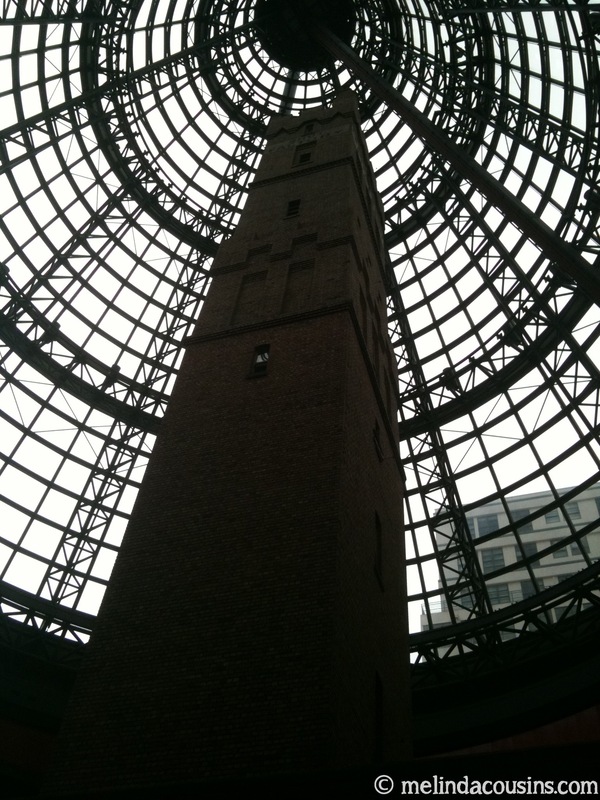 But I’m not ashamed to say that I am a fan of Melbourne. I’ve spent quite a bit of time there over the last few years due to work and study, and it has really grown on me. The city is well laid out and easy to navigate, the public transport system is reliable and extensive, and the range of food, art, sporting and other cultural options continues to grow every year. The weather is even beautiful some of the time (and not so nice other times, usually both within the same day). But even in the rain, Melbourne has plenty of charm. 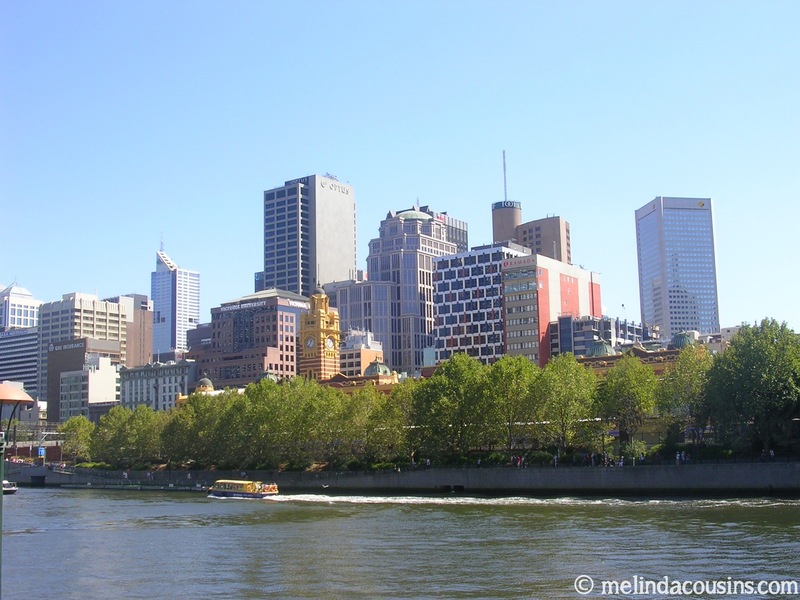 What do I love about Melbourne? Melbourne has some great little laneways and arcades filled with quirky shops and hidden culinary delights. Some recent favourites for dinner include 11 Inch Pizza tucked away on Equitable Lane and the Hutong Dumpling Bar on Market Lane, and for dessert, macarons from La Belle Miette, Hardware Lane or Little Cupcakes on Degraves Street. 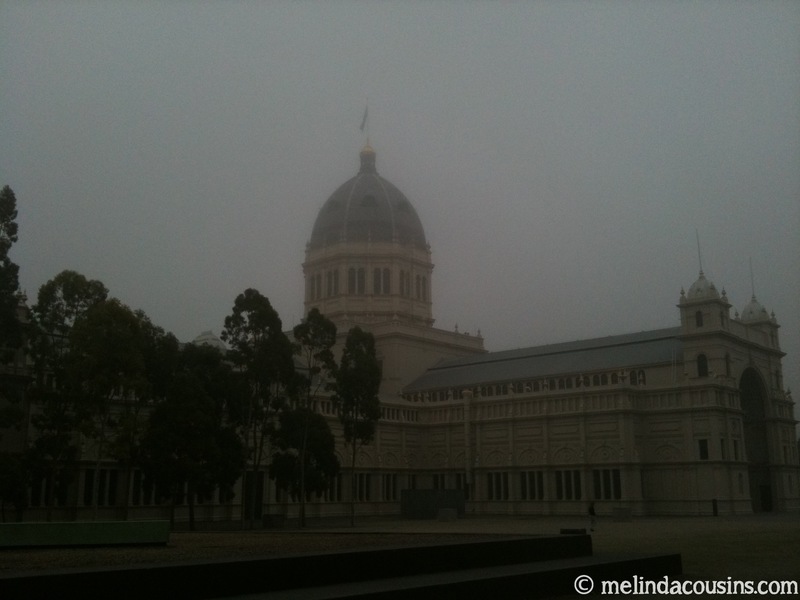 Melbourne has some gems of museums, and there are often visiting exhibitions of all kinds. The modern Melbourne Museum, right next to the World Heritage listed Royal Exhibition Building in the beautiful Carlton gardens, is a lovely spot with plenty to see and learn from. At night, strolling along the Southbank precinct provides a great atmosphere for people watching with buskers and street artists, lots of places to eat and drink, and the strangely mesmerising “Gas Brigade” of timed fireballs along the river outside the Crown Casino. 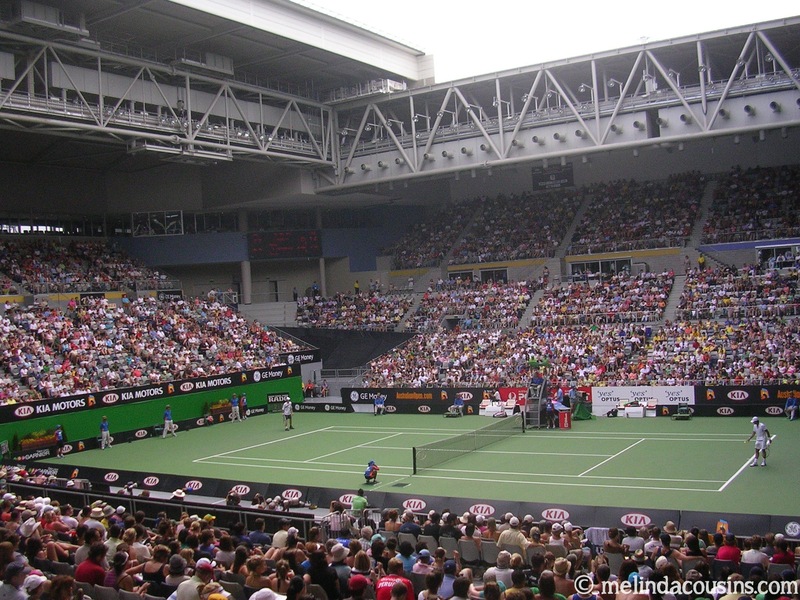 And of course, Melbourne is famous for its sport. 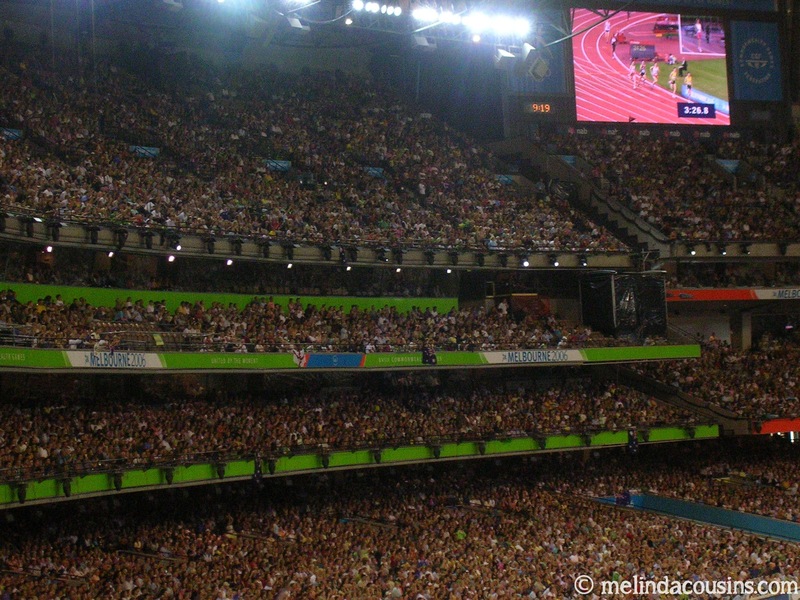 I’ve loved dropping in to the Tennis at the Australian Open, the F1 Grand Prix at Albert Park, and both AFL games and cricket matches at the MCG – they are all well worth attending if you get the chance. 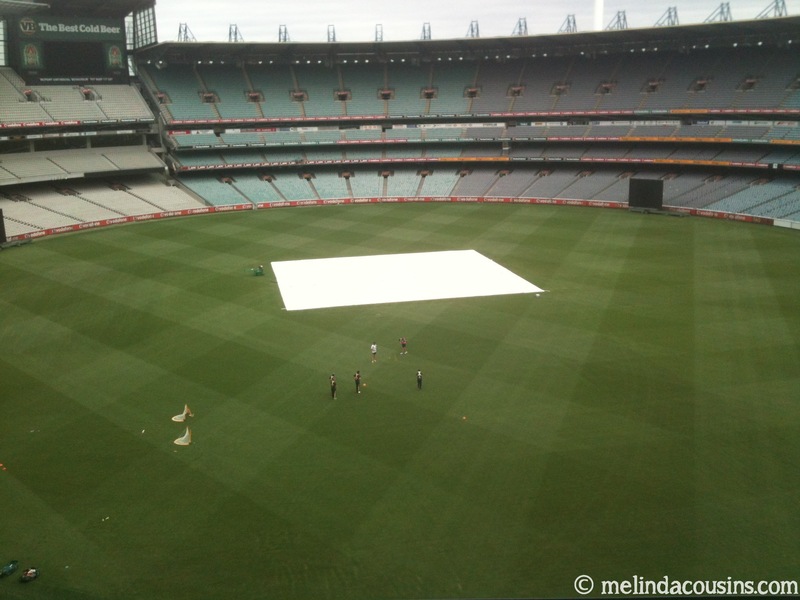 I’d also highly recommend the MCG tour during the day, with time to look and play in the National Sports Museum. Even for a non-sporting-fanatic, this was good fun. 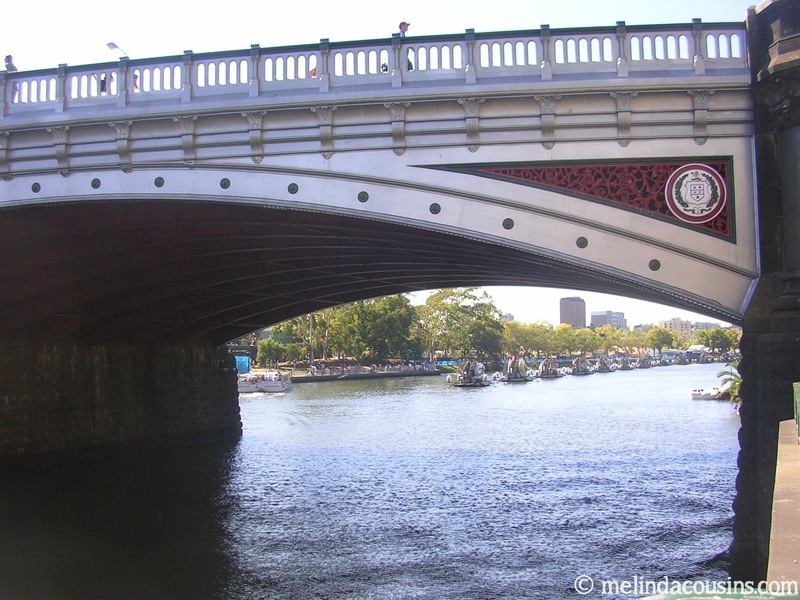 What have I learned from Melbourne? Most of all, spending time in Melbourne has reminded me (as a Sydney/Adelaide person) not to judge a book by what other people say about its cover! Every place has its beauty, its charms, its lessons and its challenges. There is always something to enjoy and something to discover, wherever you go, if you are willing to look, listen and learn. I’ve also learned that Australians will always compete with each other, and pay each other out, particularly about their home towns. We have that luxury because they are all pretty great, because we live in a country that is rich materially, as well as rich culturally due to those who have chosen to make their home here from all over the world. So it’s no surprise to me that Adelaide, Sydney and Melbourne consistently rank in lists of the world’s most liveable cities. I’m grateful that I have had the privilege of exploring and enjoying all three of them. I pray that the people of my nation might grow in gratefulness for all that we have, and in generosity to share it with all those who might wish to join us in the future.